The Work-Energy Theorem Affects Santa’s Sleigh! I hope all the good little boys and girls got Santa’s presents, because his sleigh was spotted yesterday on radar moving at an alarmingly slow pace. As the radar screen here shows, the progress of Santa and his reindeer had slowed from an initial velocity of v1 to a much slower velocity of v2 over the distance, d, he traveled from his workshop. Upon closer examination, the radar operator noted that the North Wind was especially powerful this year, which caused Rudolph and the gang to double their efforts to overcome its negative force. Did Santa make it in time to deliver Christmas presents? Find out next time, when we put the developing drama into the form of mathematical equations. 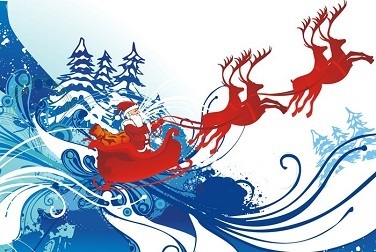 Posted in Engineering and Science | Comments Off on The Work-Energy Theorem Affects Santa’s Sleigh! My work as an engineering expert sometimes involves computations of energy expended, as when I must determine how much energy is required to move something. But sometimes the opposite needs to be calculated, that is, how much energy is required to stop something already in motion. That’s the subject of today’s discussion, which we’ll approach by way of the Work-Energy Theorem. The Work-Energy Theorem states that the work required to slow or stop a moving object is equal to the change in energy the object experiences while in motion, that is, how its kinetic energy is reduced or completely exhausted. Although we don’t know who to attribute the Theorem to specifically, we do know it’s based on the previous work of Gaspard Gustave de Coriolis and James Prescott Joule, whose work in turn built upon that of Isaac Newton’s Second Law of Motion. Consider the example shown here. A ball of mass m moves unimpeded through space at a velocity of v1 until it is met by an opposing force, F. This force acts upon the ball over a travel distance d, resulting in the ball’s slowing to a velocity of v2. Does the illustration make clear the Work-Energy Theorem dynamics at play? If not, return for the second part of this blog, where we’ll clarify things by getting into the math behind the action. My work as an engineering expert has often required that I perform calculations to quantify the energy consumed by electric motors and steam turbines, such as when they work together at power plants to generate electricity. Today we’ll see how work and energy share an interesting relationship that is brought out by examining the units by which they are measured. 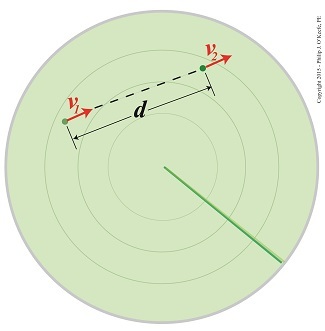 The Newton, as discussed previously in this blog series, is shorthand notation for metric units of force, and we’ll use those units today to demonstrate the special relationship between work and energy. We’ll start by supposing that you’re unfamiliar with the Newton as a unit of measurement. In that case you’d have to employ longhand notation to quantify things, which means you’d be measuring units of force in terms of kilogram • meters per second2. If you’ve been following along in this blog series, you’ll recognize that the unit of measurement used to compute work, namely, kilogram • meters2 per second2, is the same as was used previously to measure energy. That unit is the Joule, which is considerably less wordy. Equations (2) and (3) bear out the interesting relationship between work and energy — they share the same unit of measure. This relationship would not be apparent if we only considered the units for work presented in equation (1). Yes, work and energy are measured by the same unit, the Joule. But, energy isn’t the same as work. Energy is distinguished from work in that it’s the measure of the ability to perform work. Stated another way, work cannot be performed unless there is energy available to do it, just as when you eat it provides more than mere pleasure, it provides your body with the energy required to perform the work of pushing a wheelbarrow through the garden. Next time we’ll see how work factors into the Work Energy Theorem, which mathematically relates work to energy.